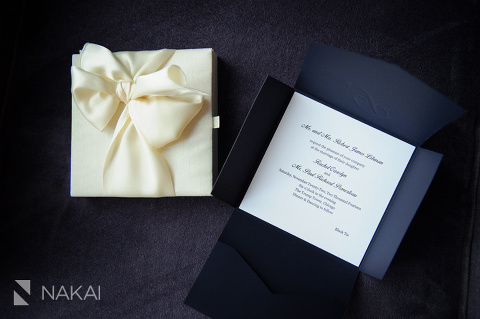 A Beautiful Wedding at the Trump Hotel – Rachel + Paul! “Wow” – That was a word I said a lot on Rachel + Paul’s wedding day. 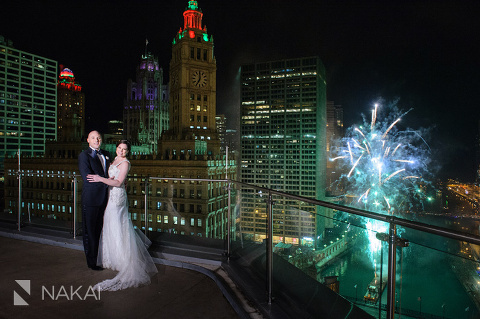 Combine fireworks, the Chicago Trump Tower and the talented Rishi from HMR Designs…and you have an amazing luxury wedding! First off- I want to share my two of my favorites from their wedding day! The fireworks over Michigan Avenue as viewed from the terrace on Sixteen! The Trump had the most unique vantage point! 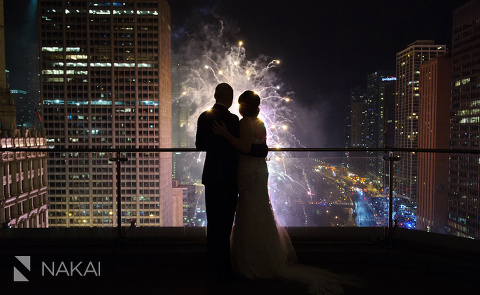 I decided to be a little creative and capture their silhouettes against the fireworks- It’s moments like these…that make my job as a wedding photographer so rewarding! It’s a once in a lifetime moment! Her beautiful Francesco Sacco shoes! Beautiful ensemble- The gown…her hair and hair piece go together so perfectly! We headed down to the first floor of the Trump for their wedding photos! HMR Designs wedding ceremony decor in the Trump Grand Ballroom. It literally took our breath away! One of Rachel’s nieces said it best, “wow…they make things like this in real life? I thought it was only in movies!” Kudos to Rishi and HMR Design team! A luxury wedding ceremony- simply beautiful! Backstage…my second photographer caught Rachel taking in the moment before she walked down the aisle! I love this photo- I wanted to combine their Chuppah and their emotions to make this photo! I smile every time I look at it! HMR Designs flipped the Trump Grand Ballroom from the ceremony to the reception- I love all the colors and beautiful flowers! The decorations were all make of sugar! I don’t even know what words to use to describe it! First dance pictures underneath their beautiful chandelier! This might be one of my favorite moments caught in a photograph…look at Paul’s eyes…pure happiness! It’s always a good time during the hora! The Ken Arlen Evolution Orchestra provided the music and energy all night! And to end the night…I leave you with two more photos from the 16th floor terrace of the Trump Hotel! I love the Chicago skyline! Thanks Rachel + Paul for having me as your wedding photographer! There were so many amazing details and moments throughout the day! I hope you are able to relive your day through your wedding photos! « Four Teaser Photos at the Four Seasons!